Special set: including wall / ceiling mount! Training without limits – for sportsmen with highest demands! aeroSling ELITE sling trainer - Dynamic resistance training without limits! Discover the aeroSling ELITE sling trainer with integrated pulley. All you need is a suspension possibility, for instance a ceiling, a tree, a climbing frame, wall bars, a door frame, etc. and your own body weight. The sling training is a very effective training method, which trains the whole body. The sling trainer generates the instability; your body weight serves as resistance. Complete courses of motion and muscle chains are trained to support strength and flexibility and especially the muscle coordination. The high-quality aeroSling ELITE sling trainer offers you fitness for every occasion and is the perfect all-rounder for the training while being on a business travel or at the hotel. Weighing itself only 600 g and being of a low size, it can be put in every (travel) bag and you can use it everywhere. Functional, variable, innovative - the modern kind of fitness! aeroSling ELITE – Innovative pulley for an unbelievable exercise variety and a maximum performance! aeroSling ELITE sling trainer – Premium product of highest quality! The aeroSling ELITE sling trainer is made of materials of highest quality, which originate from the climbing sports. It guarantees long-time training fun and fulfills highest requirements. For a good reason, the ELITE sling trainer is not only used for home fitness but is also very popular at fitness gyms, for therapeutical use or for personal training. Offering a maximum user weight of 200 kg, the ELITE sling trainer is far above the maximum training load of other manufacturers. In addition, it is not equipped with any flat bands but with extremely strong, compact ropes and slings - ideal for high loads. Exercises, which demand to bring all your weight on the aeroSling ELITE, i. e., dips or chin-ups, can be easily done. aeroSling ELITE sling trainer Basic-Set - The upgradable sling trainer for everybody! The aeroSling ELITE sling trainer convinces by its modular design, that means, it is upgradable by respective accessory. Accessory, which makes your training even more diversified. Single parts, like the pulley or handles, can always be replaced. 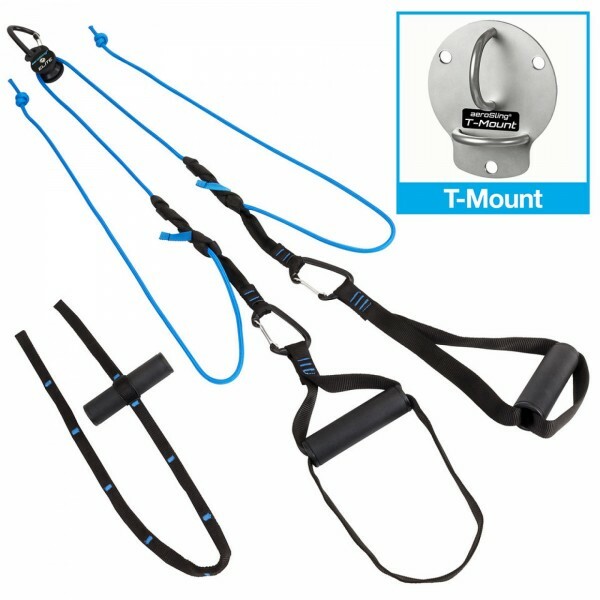 The provided anchor sling ensures that the ELITE can be mounted almost everywhere. The use and the mounting of the sling trainer is easy and quick to learn. The instructions are well illustrated and give precise explanations - from the adjustment of the handles to the mounting with the anchor sling. The T-Mount wall / ceiling mount is included in the Basic set of the aeroSling ELITE sling trainer! The aeroSling is the test winner of the sling trainer comparison! In the big sling trainer comparison of vergleich.org, the aeroSling ELITE became the test winner and left six renowned competitors behind. In the overview of the test it is striking that the aeroSling ELITE is not only the test winner but also received the best evaluation with an average customer rating of 4.8 out of 5 stars.